Portland, US company - Italian name - made in Canada! During our latest trip to the local Vespa dealership we came across some pretty cool stuff. 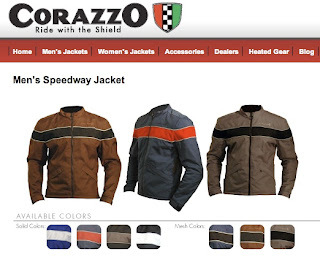 More on that in future, but for now we'll tempt you with a riding apparel company called Corazzo. Trusty Google Translator indicates that Corazzo is Italian for armour. Seems fitting for a company making riding apparel and accessories. If all the skulls and crossbones gear at your local shop have you wondering if there's anything a little more stylish that will keep you looking stylish AND be protected, well - Corazzo is a company you might want to check out. "Corazzo is proud to design and manufacture our garments and accessories in North America (California and Oregon and Canada), sourcing our raw materials from companies that manufacture in the US, whenever and wherever possible. Corazzo uses the only the highest quality materials, like real Cordura~ fabric from DuPont, the best Scotchlite reflective material from 3M, YKK Zippers and armor from Knox, the world's leader in impact protection for two-wheeled riders." We've not had the opportunity to test any of the products, seeing as we've just discovered the company, but they do appear to be well made stuff that makes use of quality materials. The friendly shop owners brewed me a coffee while I had a look at all the treasures in the shop. I'm told the Corazzo Under-Hoody is particularly irresistible. Certainly looks like it'd be comfortable on a chilly morning ride!